The idea of universal remotes is nothing new, as is the idea of interactive smartphones. What has only been done sparingly, and mainly with home theater PC (HTPC) focused consumers in mind, has been the leveraging of your smartphone with your home theater. 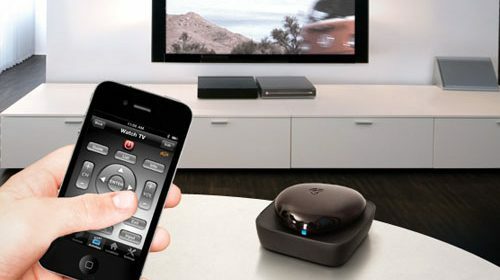 Griffin has made a name for itself for more general consumer electronics components, but is aiming to step in our world today with the Griffin Beacon remote device, which is aimed at the more general home theater user in place of a traditional universal remote. It’s idea is simple–merge the online capabilities of your iPhone (Android coming soon) with traditional infra-red (IR) devices. With an MSRP of $69.99, the Griffin Beacon is priced fairly close to traditional universal remotes from Harmony such as the 650 or 700, which means it has its work cut out. The packaging is very retail friendly, with an opening flap with information and a clear tray to see the device from outside the box. There is little excess packaging as the contents include the device, a small manual and some batteries. The product is essentially two core components–the actual Griffin Beacon hardware and the Dijit software, which is required for the device to operate. For now only iOS is supported, but Griffin has confirmed they are working on an Android version of the application, but it is still TBD whether or not it will function on the existing hardware model, but we are sure hoping for that. As with most universal remotes, the setup is the most time consuming process as this is where the device must recognize all of the components in use. Physical configuration is as easy as inserting the four AA batteries and then ensuring that the Griffin Beacon unit is aimed directly at your AV stack (where your STB, TV, etc are). The device operates with a Bluetooth receiver to communicate with your phone and then transmits the signals to your devices via IR–so if you have any RF devices, those will not function. While most folks have a coffee table, it is worth noting that the Beacon will most likely have to sit on it for line of sight to your devices, and may not be the most welcomed addition to your living room by your significant other. Once everything was positioned, the Griffin Beacon is paired to the iPhone in the same manner as you would a Bluetooth headset–press the top of the Beacon down until the light blinks and it’s detected by the iOS Bluetooth manager. Everything after this point requires the Dijit software, made by Dijit Media, Inc, a separate company from Griffin. While I worry about any device being tied to two separate vendors, this may help in the future since Dijit seems fully committed to their sole TV and device software and technology, where Griffin has relatively low overhead for the hardware itself. The Dijit software is very refined and all the steps are relatively easy to follow in a Step 1, Step 2, etc chronological order. If something does not work, Dijit tries something else and then asks if that step works. I had no problem detecting the proper IR remote codes for my Panasonic plasma television or Onkyo audio video receiver (AVR). When going to configure my home theater PC however, this became a chore as there was no detected device. I settled on selecting the “Microsoft DVR” which was not an exact button match, but seemed to work well enough. I tweaked its settings to get properly. According to the Dijit website, over 200,000 devices are supported, but the omission of HTPCs was disappointing. Once all of the components are setup then you can create activities which can merge them. For “Watch TV” it can turn on your television, STB and AVR, and have the channel change buttons controlled by STB and the volume buttons controlling the AVR. If this sounds oddly familiar, it’s because it’s the same type of “activity” based macro paridigm that Logitech has been using in its Harmony remote software for years. I found its configuration though to be similar to Logitech’s, for better or worse. I won’t spend too much time on the basic functionality of controlling the devices and using the regular activities outside of saying that, when properly configured, everything works exactly like it should. After 60 minutes without activity, the Griffin Beacon turns itself off to conserve battery life, and then you have to press the top of the device in order to wake it. If this sounds annoying, it’s because it is. The last thing I want to do when I’m leaning back watching a movie is to move to press a button. I understand battery life is critical, but I’d rather have the Beacon require an AC outlet and always be powered on instead of the constant sleep I experienced–although, then the range would have to be improved so it wouldn’t HAVE to sit on your table with a power cord. At the most basic level, the Griffin Beacon is a fully functional universal remote control. What makes this solution stand out from the competition is the software’s ability to leverage the power of iOS and the Internet to make your television watching experience more social. The Dijit software ties in very aggressively with Facebook and wants you to watch and rate shows and then share all this information with your Facebook friends. I’m not a fan of these types of status updates but I’m sure there’s a customer base that loves this, since I know this feature is very popular in Boxee. In addition to sharing what you’re watching and what you like to the world (well, via Facebook, not Twitter), the Dijit software also has an interactive television guide which operates completely separate from your AV devices.. What this means is, the channels are synced with the guide (so NBC shows as channel four), and then Dijit uses its own guide to provide more detailed information. This would be a great feature for users of set top boxes (STB) which tend to be slow and just terrible, but for Windows 7 Media Center users whose guide is arguably the best out there, the additional value is limited. The nicest part of this feature however is the ability to look at the guide and tune to stations without having to pull up the EPG on the full screen; a vast improvement over a normal universal remote which requires the use of the on-screen electronic program guide (EPG) and then minimizing whatever you are currently watching. Of course, if you have family or friends sitting with you that want to see what else is on, this feature becomes useless. Also, there’s no ability to look into your DVR to see what’s recorded already, so for the most part there’s still a lot of the traditional button presses you would be familiar with. With the interactive guide there is also the ability to setup favorites and reminders, where the application will tell you when your favorite show is on. Being a DVR user, this feature really only is relevant for sporting events for myself, but I’m sure there are some of you who can’t miss the live airing of Jersey Shore. The last feature included is the ability to manage your Netflix queue. You can not actually watch any of the movies directly or send them to your TV of course, but this does allow you to not have to leave the TV application in order to re-organize your queue. So if you happen to glance upon a trailer for an upcoming movie or Blu-ray release, you can add it to your Netflix without having to jump around applications. One of the greatest disappointments for me is in regards to the Griffin Beacon’s battery life–advertised at eight weeks with the four non-rechargeable AA batteries, I found that to be a very generous estimate. While we tend to watch a fair amount of television, not being able to control the devices because the device is out of batteries was an uncomfortable situation. I would highly recommend using rechargeable batteries and keeping a spare set handy. The Dijit application does allow you to view your battery life in its settings (pictured above) but still you need to go there to pay attention to it. After taking a look at the Griffin Beacon, I must admit to being very conflicted. For HTPC users, the Beacon really does not leverage the computer’s abilities; most obvious in the difficulty even configuring it as a controllable device. For regular consumers with more traditional components however, the Beacon is fairly simple to setup and configure. That being said, with an MSRP of $69 the device is dangerously close to a dedicated universal remote solution such as the Harmony 700 or Harmony 650 controllers. I know that neither of those offers the interactivity provided with the Griffin…but both will stay in the living room and not require me or my iPhone to have to be there for function. Could I get both? Sure, but then at that point unless I truly love those interactive features, I would save the $70 for another toy. Thanks to Griffin for providing this review unit. If you have a coffee table and a significant other, also get some double sided tape and velcro. Then stick the beacon underneath the table. If it’s a glass table, cover with magazine or vase.